There were cigar butts in the cupholders, ashes in the shift boot, tobacco on the passenger seat, and just grossness. Should have worn a Tyvek suit. First, this car was disgusting. To the degree that I put on thick rubber gloves to clean it. The guy was a smoker. Cigars. And there were cigar butts all over. Plus loose tobacco where I’m guessing one had come apart on the passenger seat as well as on the floor and elsewhere. EWWWWWW. Plus it was just straight up grimy. The driver’s door was nearly black with unidentified grossness. Spent a long time removing all the garbage, then went to the car wash to use one of the industrial vacuums. 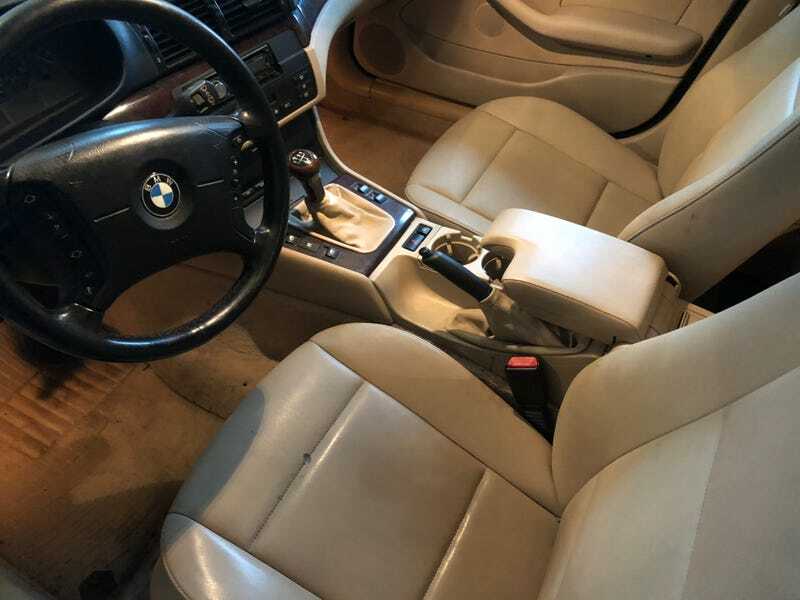 Back home and a lot of scrubbing with degreasers etc, and the interior actually looks really good, as you can see in pics. I have no before pics, it was like a crime scene. Not sure what I’m going to do with it. It absolutely needs a coolant expansion tank and thermostat. I won’t drive it again until those are done. From there, there’s a bit of oil dripping somewhere and hitting the exhaust, that’s annoying and potentially dangerous. Then there are the tires and windshield, shifter bushings, and a few misc bulbs. I feel like after that it’d pass inspection and be a decent winter toy. I really like the size of it and the interior in general. BMW changed after this generation in my eyes. The E90 onward never spoke to me like these and prior generations did. Dunno. It’s a project for sure. This guy could have done so much better if he had just kept the damn thing clean and not smoked in it. This door panel was almost entirely black with some unidentified substance. Found a couple of mini bottles of Goldschlager back here. Plus more dirt, matches, tobacco etc.